A year of weekly interviews (1949-1950) with artist Diego Rivera by poet Alfredo Cardona-Pena disclose Rivera's iconoclastic views of life and the art world of that time. These intimate Sunday dialogues with what is surely the most influential Mexican artist of the twentieth century show us the free-flowing mind of a man who was a legend in his own time; an artist who escaped being lynched on more than one occasion, a painter so controversial that his public murals inspired movements, or, like the work commissioned by John D. Rockefeller, were ordered torn down. Here in his San Angelin studio, we hear Rivera's feelings about the elitist aspect of paintings in museums, his motivations to create public art for the people, and his memorable, unedited expositions on the art, culture, and politics of Mexico. The book has seven chapters that loosely follow the range of the author's questions and Rivera's answers. They begin with childlike, yet vast questions on the nature of art, run through Rivera's early memories and aesthetics, his views on popular art, his profound understanding of Mexican art and artists, the economics of art, random expositions on history or dreaming, and elegant analysis of art criticisms and critics. The work is all the more remarkable to have been captured between Rivera's inhumanly long working stints of six hours or even days without stop. In his rich introduction, author Cardona-Pena describes the difficulty of gaining entrance to Rivera's inner sanctum, how government funtionaries and academics often waited hours to be seen, and his delicious victory. At eight p. m. the night of August 12, a slow, heavy-set, parsimonious Diego came in to where I was, speaking his Guanajuato version of English and kissing women's hands. I was able to explain my idea to him and he was immediately interested. He invited me into his studio, and while taking off his jacket, said, "Ask me..."
And I asked one, two, twenty... I don't know how many questions `til the small hours of the night, with him answering from memory, with an incredible accuracy, without pausing, without worrying much about what he might be saying, all of it spilling out in an unconscious and magical manner. A series of Alfredo Cardona-Pena's weekly interviews with Rivera were published in 1949 and 1950 in the Mexican newspaper, El Nacional, for which Alfredo was a journalist. 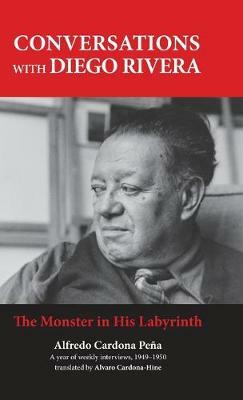 His book of compiled interviews with introduction and preface, El Monstruo en su Laberinto, was published in Spanish in 1965. Finally, this extraordinary and rare exchange has been translated for the first time into English by Alfredo's half-brother Alvaro Cardona Hine, also a poet. According to the translator's wife, Barbara Cardona-Hine, bringing the work into English was a labor of love for Alvaro, the fulfillment of a promise made to his brother in 1971 that he did not get to until the year before his own death in 2016. Buy Conversations with Diego Rivera by Alfredo Cardona Pena from Australia's Online Independent Bookstore, Boomerang Books.